This Menthol 1% Cream is ideal for dry, irritated skin. The menthol provides a cooling sensation to relieve itching while the moisturising base eliminates dryness. Excellent treatment to bring relief for adults whose skin is dry and itchy without a visible rash or damage. 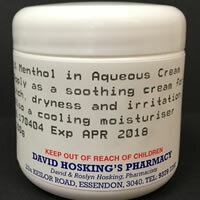 For example, Menthol 1% Cream is perfect for older patients whose skin becomes dry, itchy and fragile (particularly on the legs) due to ageing of the skin. For those suffering visible itchy skin conditions such as eczema, psoriasis or dermatitis, we recommend our Psorexederm Cream. Please note that this product is not suitable for children. For dry or irritated skin in infants and children, we recommend our Hypoallergenic Face & Body Balm.